"Santa Fe Special" brought home! MODEM BURNER! 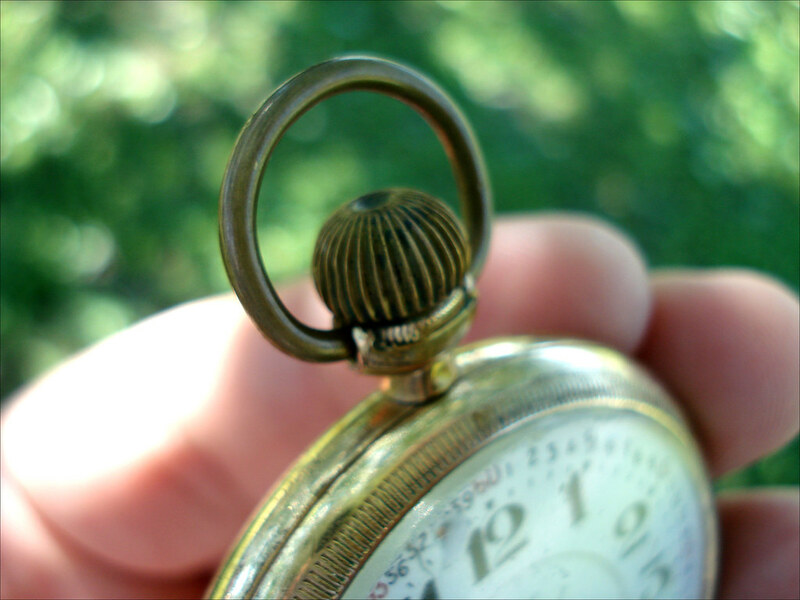 Discussion in 'Pocket Watches' started by colemanitis, May 7, 2009. My dad returned home last week from Oklahoma and brought with him my Great-Grandfather's Railroad "Santa Fe Special" pocket watch. I'm amazed at the overall condition of it since it had been worn for many years by my Great-Grandfather while working for the Santa Fe Railroad in Oklahoma. 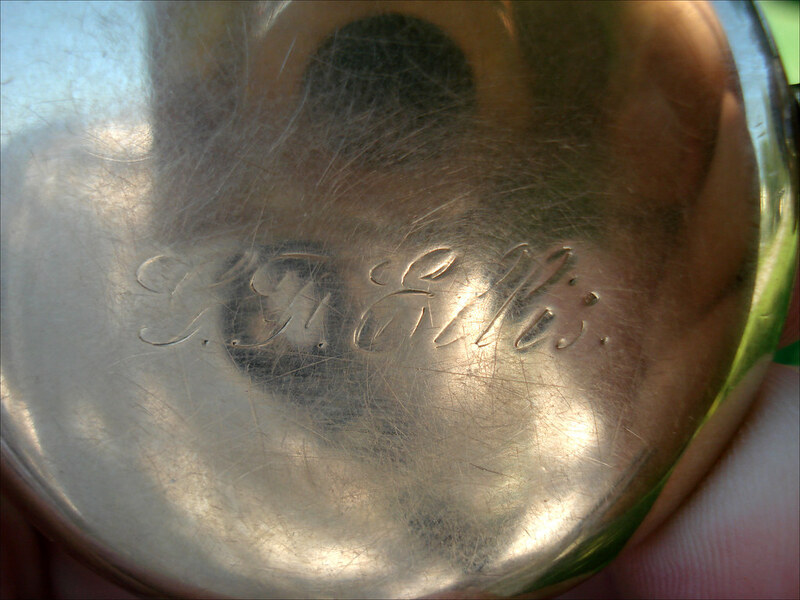 After a bit of research and some help from my fellow TKFers, I was able to determine this pocket watch was manufactured by the Illinois Watch Company, which manufactured many watches under several different names. 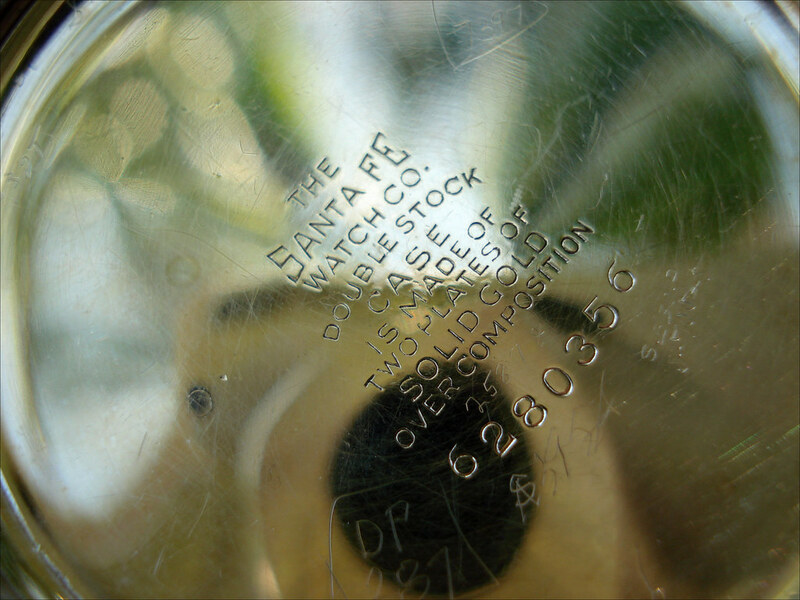 According to the serial number on the movement, this particular pocket watch was manufactured in approximately 1927, only a year before the Illinois Watch Company was sold to Hamilton Watch Company. 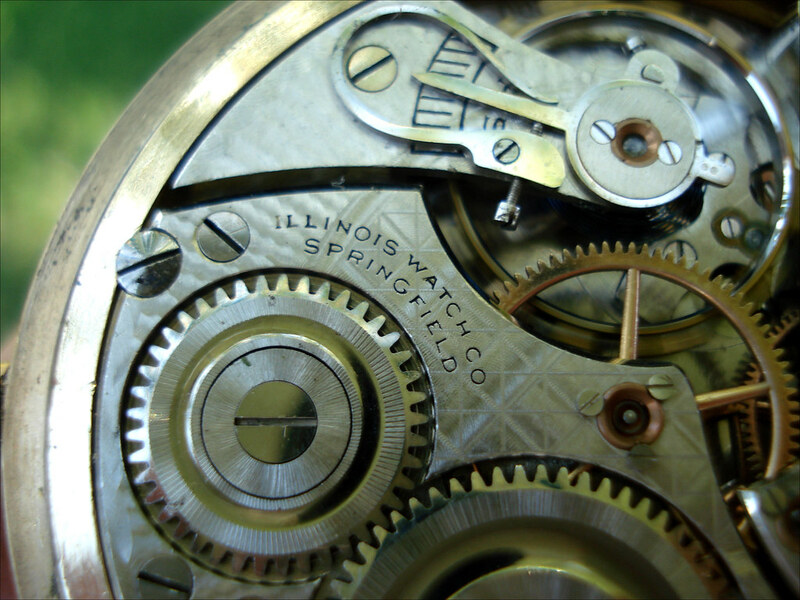 It appears the Illinois Watch Company manufactured approximately 100,000 watches each year. 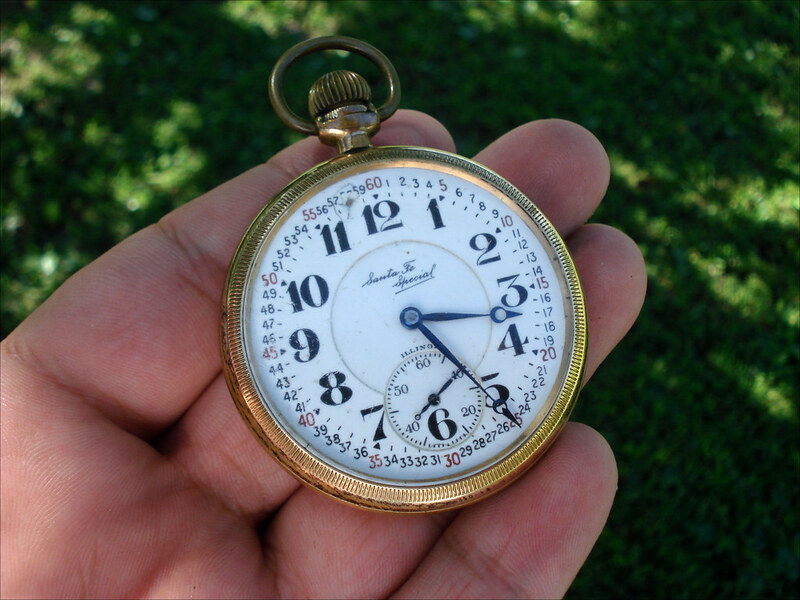 This pocket watch is in perfect working order. It winds extremely smooth. Also, what's very interesting to me is that the time is set by a lever located beneath the crystal. Like the case back, the crystal unscrews, revealing a small lever that slides out from beneath the dial. Once the lever is pulled out, turning the crown adjusts the time. 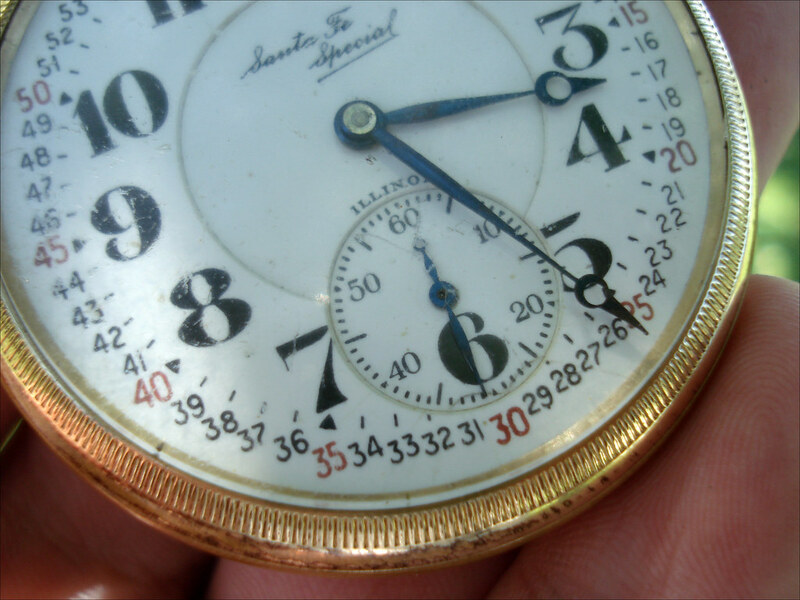 Once the time is set, the lever is slid back under the dial and the crystal is screwed back on to the case. Another nice feature is that the seconds hand sweeps like a Rolex watch. These pictures were taken BEFORE cleaning and polishing of the case. As you can see, it's quite dirty, as supposedly my Great-Grandfather was known to be a dirty man due to the nature of his work. Shortly after I took these pictures, I used a Cape Cod cloth to clean the case and to remove the super fine, hairline scratches from the case. I'll have to take some "after" pictures, as the end result is nothing short of amazing! The case looks nearly brand new, with no visible dings, dents, or deep scratches. The acrylic crystal is, of course, filled with scratches from daily use. I did apply a small amount of Brasso to clean it up, but I've never been very successful with Brasso. I'm going to order a tube of Polywatch ASAP and go over the crystal one more time. 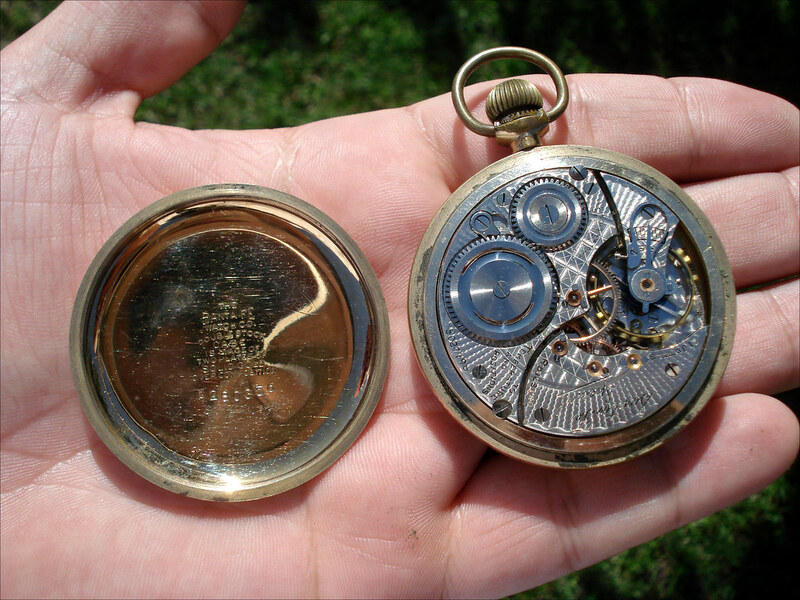 In fact, the case was so clean that my father was afraid to touch it with his bare hands and insisted that I drop it directly back in to the suede baggie in which the pocket watch has rested for many years. My father's going to spend some time looking through old photographs of my Great-Grandfather in hopes to find a picture of him with this pocket watch. The pocket watch will eventually be placed in a display case, along with the photograph if one is found. The pocket watch will remain with my dad and will be passed down to me after his passing - hopefully that'll be a long time from now. 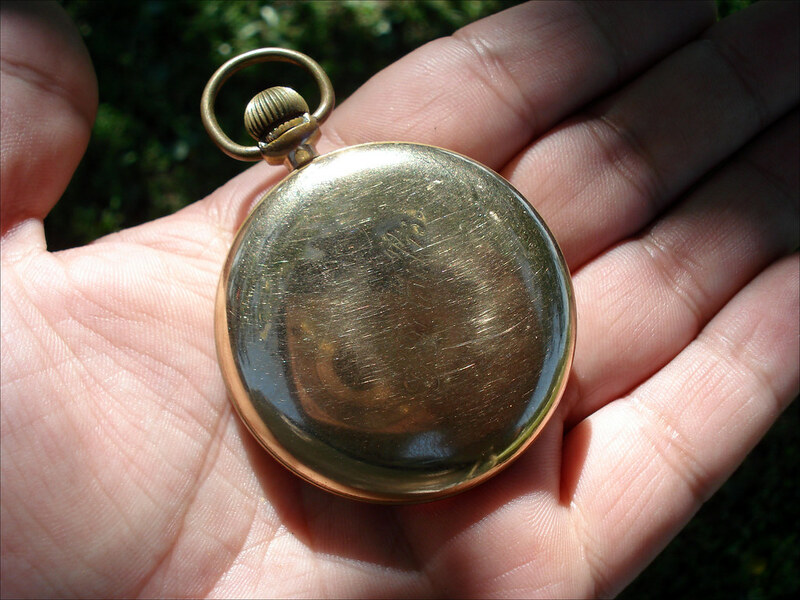 This pocket watch is a true family heirloom that will be treasured for many generations. Enjoy the pictures and thanks for reading my story! Great pictures and great watch. It would be incredibly awesome if you find a picture of your grandfather with the watch. Has the crystal on the watch ever been replaced? I asked because I don't think acrylic existed back in 1927. I will have to research it. Great story, Jeff. That's a fantastic watch with quite a bit of family history. I love the pics. Beautiful watch, Jeff. 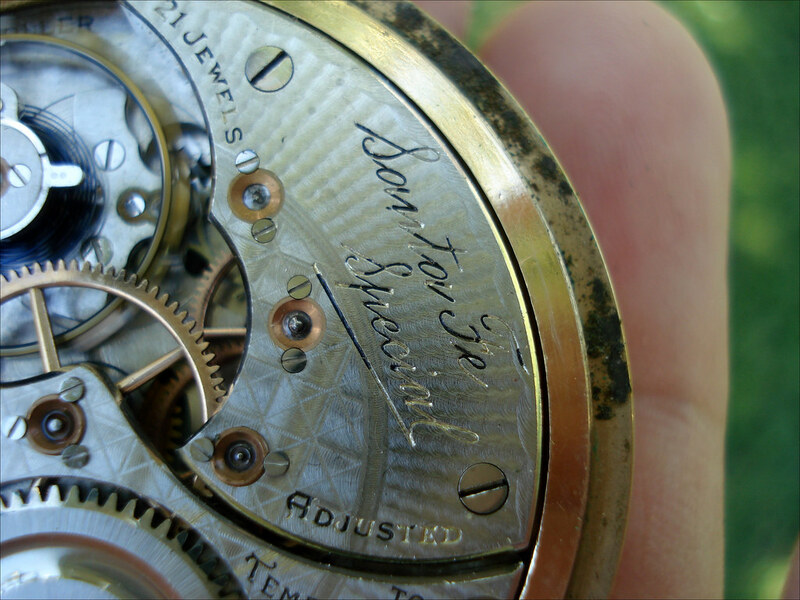 Illinois was known for the beauty of the decoration or "damaskeening" of their movements. Companies at the time competed quite strongly in beauty as well as performance. 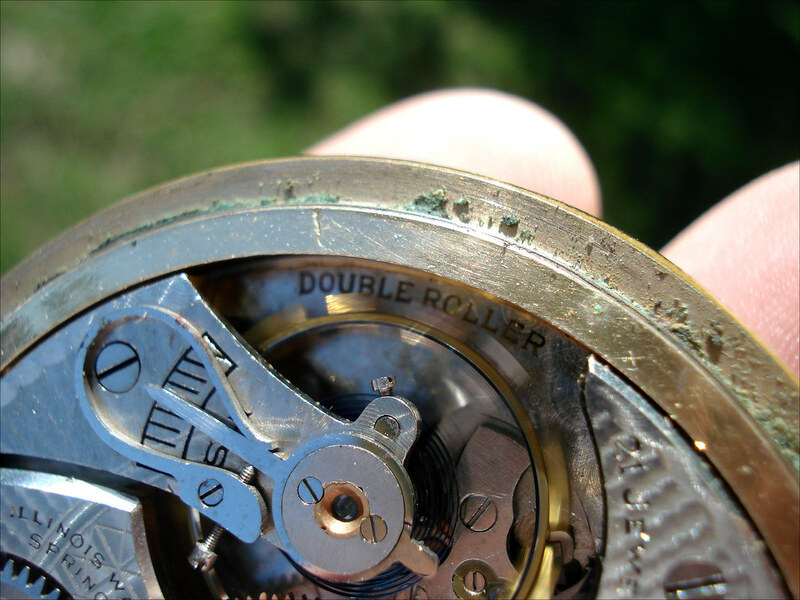 The lever setting of the watch is a real hallmark of a true railroad grade watch. 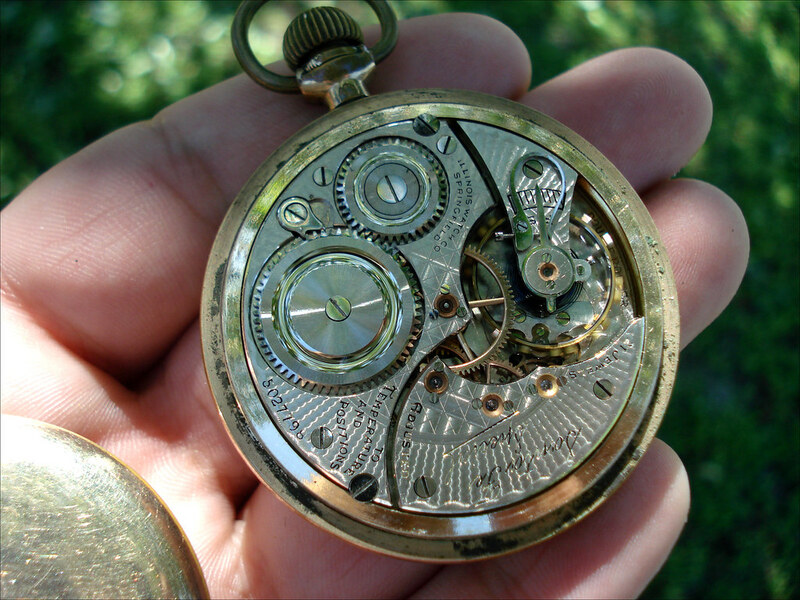 This was to preclude accidently changing the time by releasing the crown or pendant while in the railroad man's pocket. The only way to set the time with a lever set is like you said to deliberately remove the bezel, flick out the lever, and set the time. It was a real important safety feature for true railroad grade watches. Would have to research it a bit. You might want to see if there are specific forums for the Santa Fe watch or possibly railroad watches in general. They might have used either acrylic or plexiglas back in the WWII planes (don't know for certain), but as you can imagine plastics were not widely available until after WWII. The one example would be nylons. But weren't they scarce during WWII because of the war effort? You're very welcome, Jeff. 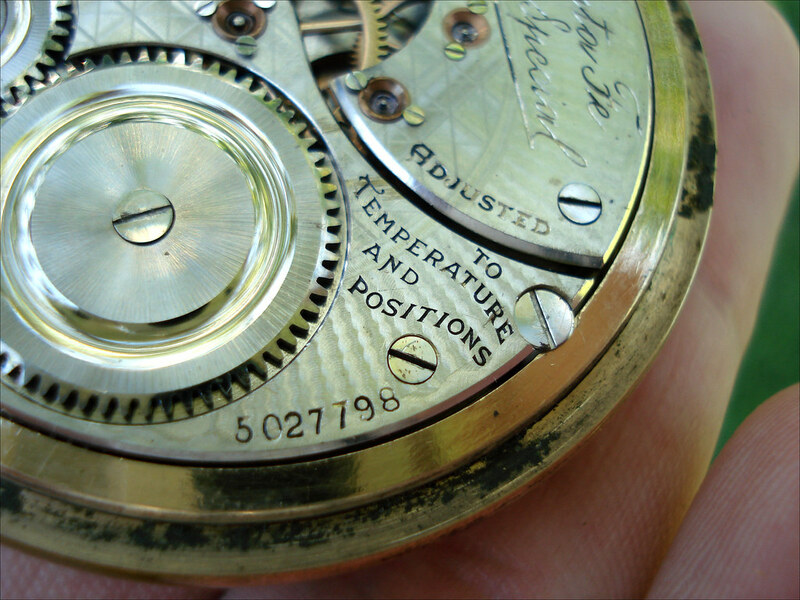 I guess a side benefit to lever setting was to also prevent the time being changed while winding the watch. Since you know the crown is only for winding there is no need to pull on it, risking damage, etc. Keep in mind that was one of the reasons Hans Wilsdorf wanted automatic movements in Rolexes, to reduce crown wear from winding, too. The crystal of your heirloom Illinois would have orignally been glass, but I have seen plastic replacement crystals. I have a plastic crystal in a keywind Swiss watch that was made approximately in the 1860s-80s time frame...obviously a service replacement. Good points, Dex. From what I understand about researching Parker 51 pens, the barrels or bodies of the pens were made from a type of acrylic/plexiglass that was like what was used in the canopies of our aircraft in WWII. It was cutting edge stuff at the time, evidently, and highly rationed. Hence, one of the reasons pen production was drastically curtailed in general, and especially of the Parker 51. Great story and history behind the watch. I hope you find some pictures as that would be really cool. Some very good information in this thread. Thanks for sharing. Jeff, what a fantastic family heirloom, steeped in the history of your family, would be wonderful to find some photos of your Great Grandfather, Grandfather, Father and yourself to pass on to the next generation. Great thread, thank you very much for posting it. Jeff, I would also document as much as possible about the watch. Get the pics, which you already doing, but also write down the history. Sit down with your father and document it. I suspect you will be passing the watch down. It becomes critical to keep the history correct so people in the future can appreciate the watch not only from an engineering/design perspective, but also from a historical perspective. That is a great idea. I've got some other memorabila that my father and I wish we had the history on as well. We discovered some things after my grandfather passed away and don't know any of the history behind it. At least we have the items. Nice to have a family heirloom means a little more that way. Because every time I see it I think of him. Can't wait to see those pics of the polished watch! As for the crystal made of glass, to test this simply put your fingers on the crystal and feel if it feels cold to the touch (plexi wouldn't). You can also breathe onto the crystal while it's cold...if the crystal fogs up, it's glass.